On Monday, ex-CIA officer Evan McMullin shook things up in America by announcing his run for the White House. Why is this important? 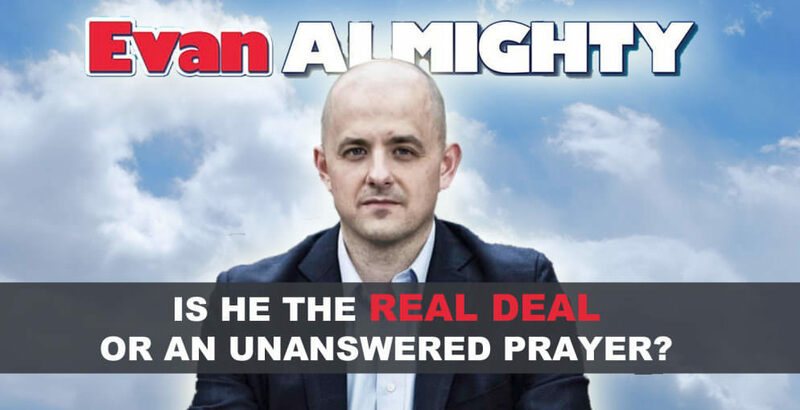 Because Evan McMullin is the voice of an authentic Conservative. An Authentic Conservative believes in small government, large military to secure the freedom of the country, low taxes, spending within a stable budget, the Legislative body creating laws, and not the President, more control at local and state level, not the federal level, and the protection of every life. The rude, crude, obnoxious, and very outlandish tactics of the Trump followers are nervous, knowing that Evan offers what neither Hillary Clinton, the liberal criminal, and Donald Trump, the RINO of modern history, a real voice for Americans, a voice of resistance to Washington and big powerful brokers of money, and the voice of Constitutional rights. Let us look at the differences between Evan, a real conservative and Donald, The RINO of the liberal party. A free America requires the strongest and most capable military and intelligence infrastructure in the world. The bravery and commitment of our men and women in uniform are unquestioned; we need to provide them the technology, training, and support to defeat the threats of today and secure our nation in the future. The answer by Evan, while we hear of huge expensive walls, fighting allies in NATO and United Nations, and supporting people like Putin of Russia are the responses we hear from Trump, The RINO. Evan gives responses like the economic vision of America should be the best place in the world for innovation, entrepreneurship, and opportunity. We must reform a system that too often benefits the politically connected and the corporate elite while leaving too many Americans behind. Our tax code should be lean, simple and encourage investment here at home. Government regulations should be reduced to foster a dynamic economy. Donald Trump talks of liberal ideals where higher import taxes, raising the already out of control costs for the low-income to even survive. Donald also talks about trade wars and a tax restructuring that will never pass Congress. An RINO offering a chicken in every pot, while a Conservative speaking of reality, and domestic sustenance. Evan does not speak of a single-payer health insurance system, where political flunkies decide who lives and who dies, but of Obamacare has failed American families, driving up costs and reducing access to far too many. With competition, deregulation and innovation we can build a modern health care system that delivers accessible, affordable and high-quality care. Vulnerable populations, including patients with preexisting conditions, should be protected. Real healthcare reform means putting patients, families, and doctors at the heart of health care. The RINO, Donald Trump speaks of a single payer system with as many, if not more regulations as the current Obamacare program. Evan espouses a limited federal government and believes the healthiest of governments is capable of going to the local level. A healthy government is accountable to its people. There is too much power in Washington, centered too far away from the lives of everyday Americans. An all-powerful government centered in Washington has eroded the separation of powers in a way that is corrosive to our Republic and our Constitution. The Executive Branch now routinely creates major rules and regulations that have the force of law, adjudicates disputes, and issues fines—all on its own. Article I of the Constitution clearly states that all legislative powers belong to the people’s representatives in Congress. Power should be shifted back to the States where it is closer to the people to whom it belongs. While Evan the Conservative espouses smaller federal influence on an individual’s life, Donald speaks of limiting the first amendment to protect him and his lying, and to limit the second amendment while we see the RINO’s offspring hunting Lions, Tigers, and more. Evan believes that God has created a life to be cherished from beginning to its natural end, and believes that American’s as a whole have a responsibility to protect all of God’s wonders in our respect for life is the most important measure of our humanity. From conception to death – and anytime in between – life is precious and we have a responsibility to protect it. A culture that subsidizes abortion on demand runs counter to the fundamental American belief in the potential of every person – it undermines the dignity of mother and child alike. Americans can and should work together to increase support and resources to reduce unintended pregnancies and encourage adoption, even if they may have different opinions on abortion rights. We hear this as a Constitutional Conservative and smile, for God is in control of these wonders, but then we listen to the Liberal RINO who flips then flops his yellow hair from to side to side as he talks out of every orifice concerning the greatness of the Planned Parenthood. He then states that Federal funding for the non-abortion portion of Planned Parenthood is a good idea. Did I think that Donald, the Rino was a great businessman? If he is as he states, any self-made business owner knows that Accounting 101 states that you can use a paper trail to move funds from one department to another as an accounting function. Donald the liberal leaner proves his inability to know a business, conservatism, accounting, and microeconomics. Donald is no more than a talking machine to give the election to the Socialist criminal Hillary. While Evan states that he waited for a better known conservative step up to the plate, he is well equipped to understand America and give an original fresh approach to the POTUS without lies, criminal activity, and a long history of questionable dealings as the RINO Donald and the Criminal Hillary offer. Evan has swept America with a fresh breath of air, a desire to vote for something than against something, and a reason to be excited once again in politics and the potential of a great leader once again navigating this great Country to safe harbor with several great opportunities for a much better tomorrow. With over 60, 000 volunteers within 24 hours give one hope, and the knowledge that many were not happy with the choices, and Evan saw this and wants America to be proud of her vote. Are you willing to stand up and be part of the Conservative movement with Evan, or are you going to sit back and give your nod to a 30 plus years of the same old game from the criminal Hillary, or to a three-timing, lying caustic, belligerent court jester RINO Trump? The options are clear. The choice is strength and depth or bullying and lying, which are you going to sit your principles upon?